This concept of "Troop Lite" has been discussed off and on here and I thought I'd report on our first experience at the next stage of this transformation. The basic idea is to get rid of the heavy plywood chuck boxes, get rid of the propane tanks and trees and hoses, and get to a state where pretty much the same gear works for all campouts from canoeing to backpacking to state parks. The boys find both the simplicity and the mobility appealing. Over the past couple of years, the most fun outings have been ones where we left the chuck boxes behind and hiked/canoed/whatever in. When we pointed this out to the boys they realized that they'd be happy if they never saw those chuck boxes again. Now, the smallest scout can carry the whole chuck box with ease, and if they go backpacking pretty much all they have to do is dump the stuff out and divvy it up - it's essentially the same gear they use all the time. This year's schedule has a number of campouts for which going light will be appropriate - one canoe-in campout, a backpacking trip, etc. and as someone here said so well, what we're trying to do is let the program drive the gear, not the gear drive the program. The biggest hurdle for making this transition has been stoves. Our old backpacking stoves were early Coleman white gas stoves that have a lot of miles on them and which have become pretty unreliable, so we used them only rarely and mostly relied on regular Coleman 2 burner propane stoves with large tanks, trees, etc. Coleman Xpert Stove has been discontinued. 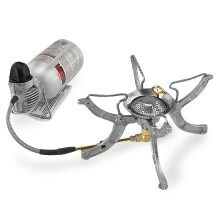 Consider MSR Whisperlite or Dragonfly Stoves. After feedback received here and after some evaluation of our own, the boys opted for Coleman Exponent Xpert Stoves. Coleman makes a 2 burner version but the boys decided they prefer the redundancy of a second stove over the convenience of one cylinder at a time. These aren't the lightest stoves around but they're not bad, and they seem pretty rugged. The manual claims that they will support a 10 lb pot, which means we aren't very constrained as to what we can do with them as long as they're on a stable surface. We found that by ordering direct from Coleman, as a non-profit, we got a really good deal and could afford to equip each patrol with a pair of them. Fuel costs will be significantly more than what we've been paying for bulk propane but when we looked at how it actually impacts weekend campout costs we decided it wouldn't be a problem. Once we got the stove thing figured out, we were able to go ahead and make the switch. The Patrol Leaders got together and dumped out a couple of chuck boxes to try to figure out what the basic stuff they needed each trip should be. Coffee pot for boiling water. A couple of fuel cylinders. (I don't think I forgot anything). We used to keep eating utensils and metal plates in the chuck boxes but those were preventing some individual scouts from taking care of themselves by providing their own eating gear, so we decided to take those out as well as other non-critical stuff. They decided that if a patrol needed anything else, they would need to figure that out at meal planning time and request it in advance from the QM - we have tons of stuff, from iron skillets to Dutch ovens to folding camp ovens, but we are trying to emphasize real planning so they are not supposed to just grab that stuff out of the scout hut unless it is on the QM's list. Dishpans for cleanup are stored in the trailer and are available when needed. Our September campout was our first outing with the new stoves, but it went well and the boys love them. They are just as easy to use as the old Coleman 2 burner stoves, seem to burn just as hot and have just as much heat control, but they take up nearly no space, and if they only need one burner they only get one out. Not much to clean either. The new "chuck box" arrangement worked out well too. Next step is to phase out the lanterns in favor of personal lights! Thanks to all of you who provided suggestions and advice along this line - it was much appreciated and enabled me to suggest some lines of thinking to them which we might not have otherwise come up with. I think we'll be very happy with the results.